HTC has been under tremendous pressure. The past year has seen their status as top Android manufacturer slowly whittled away by Samsung. Even Google, who launched the Nexus developer series with HTC, has looked towards the Korean behemoth. Things were looking bleaked for the beleaguered Taiwanese OEM manufacturer, who struggled to come up with new exciting design for the smartphones. That was until they announced their flagship monster, the One X. The One X is HTC's comeback phone. The initial press rendering doesn't do the phone any favours as the distinctive HTC design language remained the same as it was for a couple of years now. Still and I admit, the One X is one gorgeous looking smartphone and simply the best looking Android smartphone I have ever had the opportunity to use. It features a single unibody aluminium body that beautifully wraps around the display. Speaking of the display, HTC has spared no expense with the 4.7" screen. With a 720p Super LCD screen, the One X features one of the best looking display in the industry. It is by no means perfect. The display still reflects too much in comparison to Nokia's Clear Black Display filter and overall it isn't just quite as good as the IPS display on the iPhone 4/4S. But it looks great even under strong sunlight. Thanks to the high pixel density of 312 ppi and the use of none-Pentile RGB matrix, the screen looks amazingly sharp. Perhaps not quite as sharp as the iPhone 4S or Sony Xperia S, but pixels are not noticeable. Three touch sensitive soft keys reside on the bottom performs well, but I found them a tad too close to the bottom edge. Underneath the massive screen lies the new Nvidia Tegra 3, a powerful System on Chip (SoC) that also powered the Asus Transformer Prime tablet. The Tegra 3, also marketed as 4-PLUS-1, features a quad core 1.4GHz ARM Cortex A9 CPU and twelve core ULP GeForce GPU. 1GB RAM, plentiful in 2011 but perhaps not for long, helps with multi tasking. While I have not been impressed by Nvidia's previous Tegra 2 SoC, the Tegra 3 is a screamer! There are times when the UI would lag, but I attribute that to HTC Sense or apps has not been updated to take advantage of ICS's native hardware acceleration. Given the sheer power inside the device, it is fair to assume the One X is future proof and will likely be capable of running the next version of Android 5.0 Jellybean. The volume rocker sits on the left side of the device (right on yours) and blends in perfectly with the phone. On the right side you will find the single microUSB charging/sync port. The USB is the same MHL variant as seen on the Samsung Galaxy S II and the Sensation XL, so you can connect to the One X directly to a HDMI-equipped TV via a compatible MHL cable. Above you will find the single 3.5mm headphone jack, a noise-cancellation microphone and microSIM door, complete with an iPhone 4-like hole for accessing it. The power button also resides on the top, just above the front facing camera. Turning the phone aside, you will find the main camera (you can read my in-depth review of the HTC One X camera here) with 8MP BSI sensor (capable of 1080p video recording with autofocus) and the single but powerful LED flash near the top, and the loudspeaker grill near the bottom edge. The One X also has a built-in NFC chipset and antenna, but unfortunately I was not able to test this feature as I lack any other NFC gadgets to pair with. It supports the standard ICS's Android Beam as demonstrated perfectly in this Samsung Galaxy Nexus ad. The HTC One X is one of the larger smartphones I have ever tested, but it doesn't feel so. The tapered back design, lightness and overall slimness, makes the One X feels perfect in my palms. 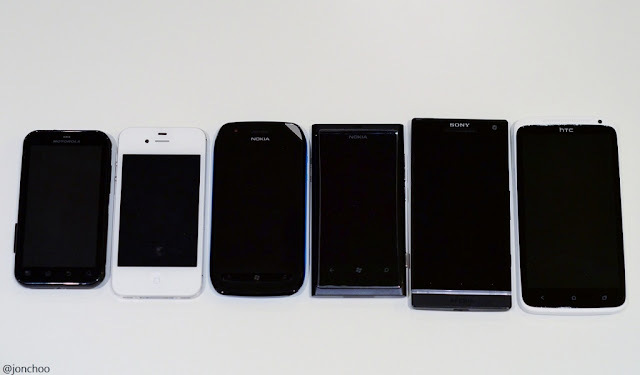 It doesn't feel much bigger than my previous Samsung Galaxy S II and in fact makes the new Sony Xperia S feels and looks bulky in comparison (despite only having a 4.3" display). There is a reason for this and HTC actually gave it a week ago. From a pool HTC conducted, they found that consumers allegedly prefer slim phones to larger batteries, and for this reason the One X is the slim phone it is. I disagree with HTC's assessment as while the HTC One X feels great, I do not think an additional 2mm of thickness will make any differences to how the One X would look or feel. Like previous HTC Android smartphones, the One X's Android OS is heavily customised with HTC Sense. I have never been fond of HTC Sense UI (version 4 here) and the One X does not change my mind about it. The UI is designed to provide maximum eye candy with animations and all sorts of unnecessary effects, which some might argue as over the top (I do). But I can't fault HTC's desire to differentiate from their competitors with Sense but I wish there was a way to disable it without having to root the device and install a custom ROM. With Google slowly improving the UI of Android with the Holo theme on ICS, one can argue that OEM customisations like Sense are no longer needed. Still HTC Sense provides plenty of eye candy, and such effects will surely win them some customers. The improvements aren't just superficial as HTC does introduce some nice features with HTC Sense. The camera app which HTC calls ImageSense (oh, HTC you an your names...) works well despite initial teething problem (a serious bug was soon fixed via an OTA update). You can read more about the camera app in my HTC One X camera review. There really isn't much to set HTC Sense 4.0 apart from their previous version. The app drawer is now horizontally presented, much like Samsung's TouchWiz. HTC has also swapped out the multi-tasking menu for their own Windows 7 Aero 3D-ish card thingy. Pretty unnecessary in my opinion as ICS already provides a superior method of accessing background apps. HTC One X also comes with Beats Audio, which is a software-based EQ. Fortunately for your ears's sake, no Beats headphones are bundled with the One X. This is a good thing as it means HTC isn't forced to jack up the price to subsidies for what are poor quality headphones. As Beats Audio is merely an EQ, it does not provide superior SQ by itself. Having said that, the One X is an okay sounding device. It won't set your ears on fire, but it isn't too bad either. A good set of IEM will go a long way. The HTC music player is pretty good at keeping up with the latest trends, offering coverflow-like UI as well as widgets for the homescreen and controls from the lock screen. Standard stuff, but they do work well. With a lovely large 720p display, the browser actually performs better than the on my old laptop that I've previously used for the past couple of years. It does lag at times and sometimes have trouble with sensing touch, but it is a pretty darn good web browser. It has support for text reflow, Adobe Flash, Java, offline, incognito mode and more. YouTube videos will play directly from the web browser, but I do find the performance here a tad disappointing. It certainly isn't as buttery smooth as one would expect from a hardware accelerated browser. Adobe Flash hiccups aside, the browser is downright brilliant. Should the native browser not rock your boat, Android Market, sorry, Google Play offers plenty of third party alternatives including Opera, Chrome and Dolphin - each with their own strengths and weaknesses. Battery life is pretty decent, but not amazing. Since updating the One X, I notice a slight improvement in battery performance. Some has commented that the One X's battery life will improve with certain hacks, but out of the box, the One X should deliver you about a day and a half of moderate use. In comparison, my personal phone, the Lumia 800, ekes out roughly a day on moderate use, no thanks to the battery sapping AMOLED display. So a big kudos to HTC for designing an Android 'superphone' that is capable to staying away from the wall socket for at least a day. But it is still a disappointment to read about how it could have been so much better had HTC installed a 3000+ mAh battery instead of the 1800 mAh battery found inside the One X. With the Samsung Galaxy S 3 due to be announced next week, it is difficult to recommend the HTC One X outright, until we know what Samsung has in store for us. Still I can't take away from the fact that the HTC One X is one of the best smartphone, from a hardware's perspective, I have ever used. It could do with a bigger battery and perhaps better software (pure vanilla ICS or a version with Windows Phone 8 Apollo in September anyone? ), but if you are an Android fan or is in the market for an Android smartphone, you really can't go wrong with the HTC One X. It is simply a superb device, marred only by the dodgy built of HTC Sense, which you can get rid off with some effort. All in all, I highly recommend this monster. Many thanks to Three UK for loaning the HTC One X. You can get yours here via Three UK on contract, or sim-free from Amazon UK. After reading your hands-on with SGS3 I am buying this today! My main concern was whether it is going to feel a little too big, but you seem to suggest it doesn't really feel too big when holding it. In any case, I coped with (and loved) my rather large Desire HD for the last 18 months so I guess it'll be OK.
We'll see anyway, as the order is placed now... ! Hi Terry! Thanks for the comment. I heard from Jenni that you did buy the One X. Hope you are enjoying it!